Now that summer is almost here, people will soon be heating up their charcoal braziers. Some people barbecue the same thing all the time, and I want to show them something new and easy to put on the grill. If you barbecue steaks, burgers or sausage every time you barbecue, get to know yakitori, an ancient Japanese grilled marinated chicken on skewers that goes back to the 17th century. When grilled, yakitori is usually served either of two ways, with salt alone or with a rich dark basting sauce (called tare) similar to teriyaki sauce. While many parts of chicken may be used, the most convenient are boneless, skinless chicken breasts. After a proper marination they can be charcoal grilled to perfection. You can do your usual barbecue regimen, but get some chicken and make this yakitori too. Your guests will be pleasantly surprised and you may decide to feature it. Combine the soy sauce with the sherry,ginger and sugar. Put this in a resealable plastic bag, add the chicken and let marinate in the refrigerator for about one hour. Combine the sugar and teriyaki and heat. This will be for dipping. Preheat the charcoal brazier or the broiler in your kitchen. Remove the chicken from the marinade and thread onto the skewers, alternating with the scallions and bell pepper. 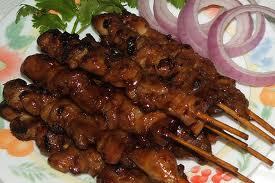 Either dip the skewers into the marinade or brush with marinade thoroughly and place on hot grill or under broiler. Cook about 4 minutes, turn and cook other side dipping into or brushing with the marinade. Do not overcook. Constantly brushing the marinade on the chicken helps to keep it tender. Hey now, this is something I cam sink my teeth into. I love Japanese style meat and sauces. I'm going to try this on over the weekend. oh goodness my mouth is watering. When this challenge is finished I will take the time to look over your recipes. They look so yummy. Ths sounds wonderful and easy to make.... a great combination! Thanks for visiting me at A Season for All Things. I'm your newest follower and look forward to finding more great recipes. I come to look through your recipes for something to take to a porch party tomorrow. I'm so glad to have you blogging. Oh wow, this sounds yummy! I wish our apartment complex would let us have a grill so I could try these out. Unfortunately, the only "grill" we have is an electric one and I don't think it would work really well for this. Maybe, I can bribe my parents into letting me use their grill. Thanks for sharing!